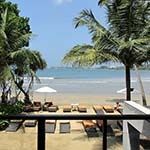 Mount Lavinia is a delightful colonial-era hotel situated on a private beach south of Colombo, with views from the terrace towards the city skyline. 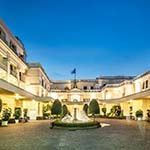 Originally the home of the British Governor, this is one of the oldest and most famous hotels in Sri Lanka. 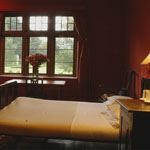 Fitted with dark wooden furnishings, each luxury air-conditioned room has satellite TV and tea/coffee making facilities. The private bathroom has a shower and free Ayurvedic toiletries. Other facilities include a large swimming pool, spa, games room, gym and three dining options. 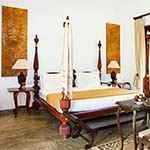 Galle Fort Hotel is set in the heart of this 360 year-old UNESCO World Heritage Dutch fort. 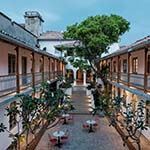 A restored gem merchant’s mansion, this elegant boutique hotel is full of charm and character and pays homage to Galle's rich culture. The suites overlook the courtyard or swimming pool, combining luxury with history, and unique architecture that reflects the hotels' surroundings. Fresh produce and seafood is abundant in the city, meaning the hotel's restaurant offers a wide range of exquisite cuisine. 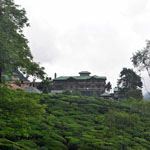 Ceylon Tea Trails consists of a small number of large classic colonial bungalows, close to Castlereagh Lake in the so-called ‘Golden Valley of Tea’. 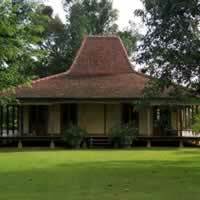 The bungalows were originally built for the British Tea Estate manager in the days of the Raj and have been restored to offer guests the unique experience of life on a working tea estate. 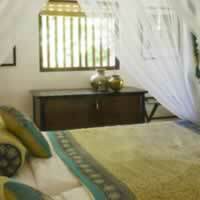 The rooms spread across the bungalows which combine heritage style with modern amenities. 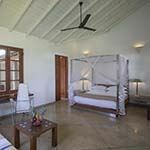 Each bungalow comes with its own manager, chef, butler and houseboys and from 4 to 6 luxurious Master Suites, Garden Suites and Luxury Rooms. 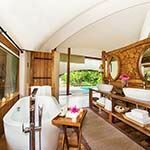 You can book a room or the entire bungalow. 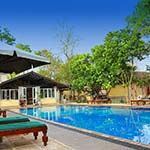 Palm Garden Village is situated in lush gardens in the ancient city of Anuradhapura, surrounded by a forest with many species of trees. Each spacious en-suite guest room is tastefully furnished with colonial-style beds, lounge area with armchairs, an ample wardrobe, writing desk, minibar, TV with satellite channels and shower. The hotel has a large outdoor swimming pool. 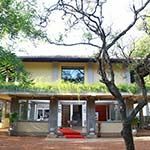 Forest Rock Garden is a delightful boutique hotel situated in 50-acres of wilderness near Wilpattu National Park. 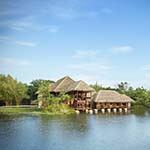 The resort features rock boulders, ponds, waterways, old trees and lotus filled ponds. 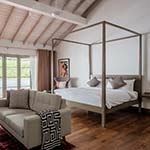 The spacious open-plan guest suites are elevated above ground, each tastefully furnished with a living area, en-suite bathroom and private terrace with plunge pool. 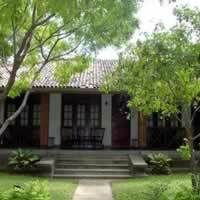 Satellite TV, air conditioning, tea/coffee facilities, mini-bar, safe and Wi-Fi are provided. 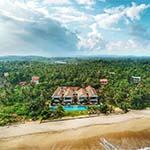 Interlinking walkways connect all suites to the spa, outdoor swimming pool, gym, open-air meditation centre, bar and restaurant that serves vegetarian, Sri Lankan and European cuisine. 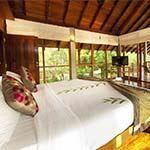 Sitting on 58 acres of tropical vegetation, Ulagalla Resort offers villas with plunge pools and free Wi-Fi. 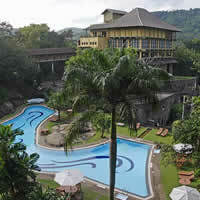 It has a spa, freshwater pool and activates like horseback riding and archery. 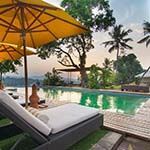 Surrounded by acres of paddy fields and orchards, Resort Ulagalla offers villas with great views. 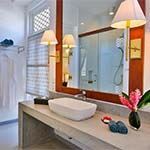 They feature a film library, a private patio which sun loungers and rain shower facilities in the bathroom. 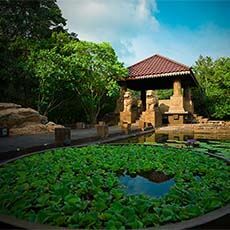 Berjaya Hotel Colombo is surrounded by natural splendour, cultural diversity and historical heritage that spans over 2,000 years. 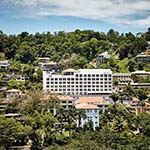 The hotel faces the beachfront on one side and is bordered by lush foliage and tropical vegetation on the other. 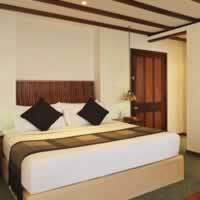 Guest rooms offer a restful, airy ambience and are equipped with all modern amenities and solid teak furniture. 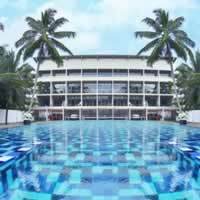 Mirage is a modern hotel located south of Colombo, near Mount Lavinia. Each elegant guest room has air conditioning, safe, minibar, free Wi-Fi and en-suite shower. You can enjoy a sea view from every room and there is a lovely outdoor swimming pool. 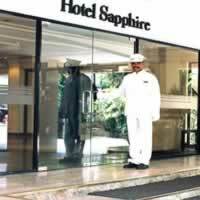 Sapphire hotel is close to the Sri Lanka National Museum and Art Gallery. 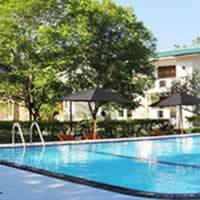 It offers modern accommodation with an outdoor swimming pool and free Wi-Fi. Each air-conditioned guest room has a minibar, tea/coffee facilities and TV. The en-suite bathroom comes with toiletries and shower. Guests can work out in the fitness centre or spend some quiet time on the garden terrace. Other facilities include an internet café, and the Chinese Golden Palace Restaurant that serves a selection of delicious Asian dishes. 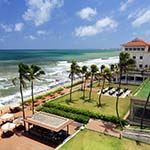 Galle Face is an iconic colonial hotel situated on the Colombo beachfront, close to the India High Commission and Beira Lake. 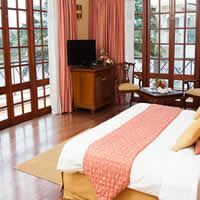 Luxury guest rooms have beautiful wooden flooring and each has a private bathroom. All rooms are fully equipped with modern amenities including premium bedding, free WiFi, TV, coffee maker, hairdryer, minibar and safe. 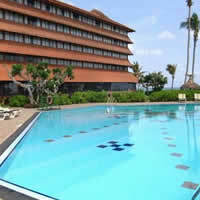 The hotel has an outdoor swimming pool with wonderful Indian Ocean views, as well as a health club and steam room. 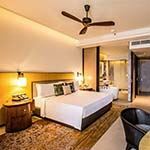 OZO Colombo offers modern accommodation in a splendid setting along Marine Drive, with some rooms having stunning Indian Ocean views. Bedrooms are all en-suite with soft beds, plush pillows, walk in showers, TV and free WiFi. Guests can relax by the rooftop swimming pool and enjoy the ON14 lounge. 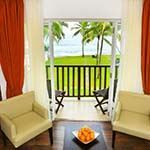 The hotel has a fitness centre and Wellawatta Beach is a 10-minute walk. 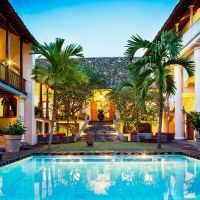 Tintagel is a private hotel situated in a stunning heritage property in an upmarket Colombo suburb, that was once home to three of Sri Lanka’s political leaders. 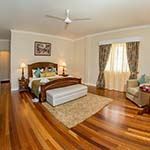 Suites have high ceilings, timber floors and are lavishly decorated - each in a unique blend of colour and texture. 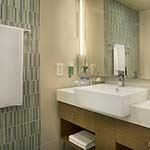 The spacious bathrooms feature rain showers, bath tubs and large vanities. 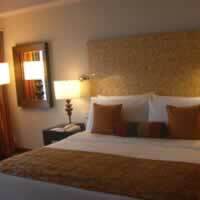 All rooms have free WiFi access, luxury bedding and TV screens with CD players. 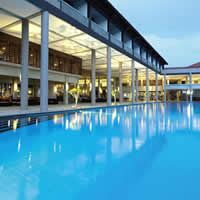 Cinnamon Grand is situated in the heart of Colombo's business and shopping centre. 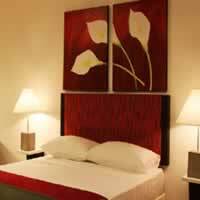 Guest rooms are luxurious and offer a pillow menu to meet your individual needs. Each room has a full length mirror and a separate seating area. 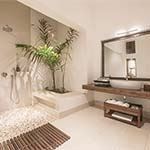 The bathrooms feature a bath tub with a shower, bath amenities, marble vanity tops and a large wall-mounted magnifying mirror. 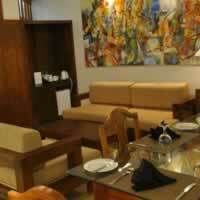 The hotel has several restaurants that serve an eclectic mix of fine cuisine. Cinnamon Lakeside is located on the banks of Beira Lake within easy reach of the major shopping mall. 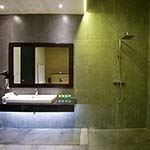 All stylish luxury rooms have a marble bathroom, flat-screen TV, safe and tea/coffee facilities. The hotel has 9 dining options and a full-service health club. Guests can swim in the outdoor pool, or enjoy a massage at Azmaara Spa. 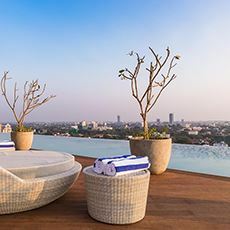 Jetwing Colombo Seven is a modern luxury hotel situated in the heart of Colombo, with a spectacular rooftop bar. 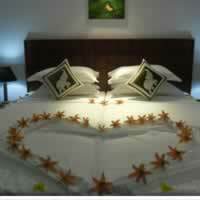 Each en-suite guest room is air conditioned and comes with satellite TV, seating area and tea/coffee making facilities. For your comfort, bath robes and free toiletries are provided. The hotel has a sun terrace and spa, rooftop swimming pool and a good restaurant. Free WiFi is offered throughout the property. 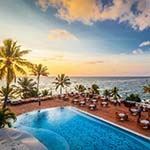 Kingsbury is a luxury hotel with a stunning beachfront location, overlooking the Indian Ocean. Each modern guest room is spacious, with oversized windows to showcase the ocean view. 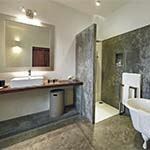 The rooms are bright and airy with cable TV, minibar, tea/coffee making facilities and marble en-suite bathroom. The hotel has several restaurants and an infinity swimming pool. 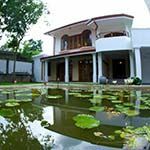 Residence by Uga is a luxury boutique hotel situated near the tranquil lakeside Buddhist temple of Gangarama in Colombo. 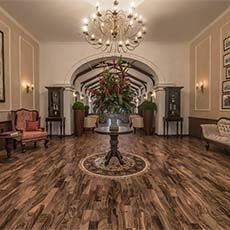 Formerly a 19th century Victorian townhouse, the air-conditioned suites have traditional decor with contemporary touches, including wooden floors and rugs. Each guest suite has a spacious bedroom with king-size bed, en-suite bathroom with large walk-in rain shower and living room. 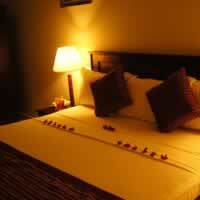 Satellite TV, free Wi-Fi, minibar, tea/coffee facilities, safe and bathrobes are provided. Other facililties include a gym, swimming pool and restaurant that serves fine international cuisine. 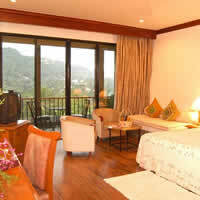 Camellia Resort and Spa is situated in the village of Audangawa. 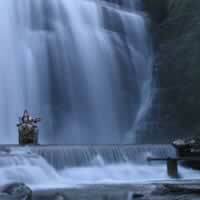 It is 5-km from Habarana and 30-minutes from Minneriya National Park. 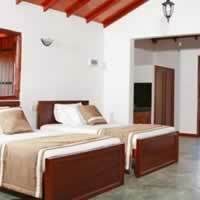 It offers well-appointed air conditioned cottages with free Wi-Fi, TV with a satellite channels and a private balcony. 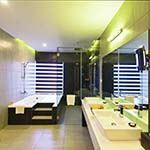 Each private bathroom has either a shower or a bath and free toiletries. The resort also has an outdoor swimming pool. Habarana Village is situated on 27-acres of beautiful countryside in the town of Habarana, bordering a stunning lake. 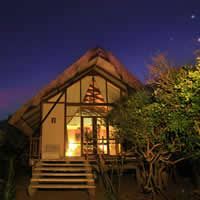 The en-suite cottages are set in clusters, each with a thatched roof like those found locally. 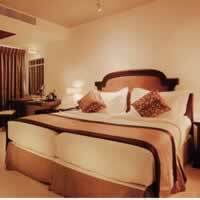 Each bedroom is tastefully furnished with all normal amenities, and the hotel has a large outdoor swimming pool. 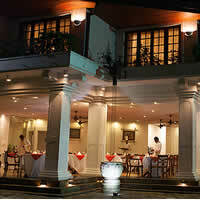 This hotel is very conveniently situated for exploring Sri Lanka's cultural triangle. Kassapa Lions Rock is situated in the small village of Digampathaha near Habarana, with wonderful views of the famous Sigiriya Rock. 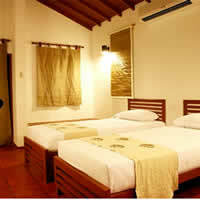 Air-conditioned guest rooms are simple but comfortable with cable TV, minibar, ceiling fan and seating area. 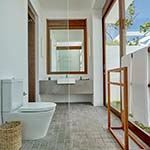 Each has an open-air bathroom with bath and shower and private balcony. The hotel also has a large outdoor swimming pool. 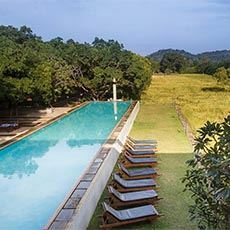 Sigiriya Village Hotel offers comfortably furnished cottages, set against the backdrop of the stunning World Heritage Site of Sigirya Rock Fortress. 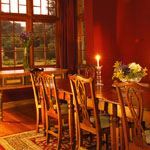 Each cottage is decorated with local fabrics and features classic wood furnishings. Bright and airy, they have air conditioning and an en-suite bathroom with showers. 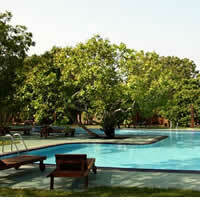 The hotel also has an outdoor swimming pool, Ayurvedic massages and tennis courts. 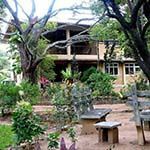 Upies Folly is a comfortable self-catering resort situated a short walk from Habarana town, close to the ancient city of Sigiriya and Minneriya National Park. 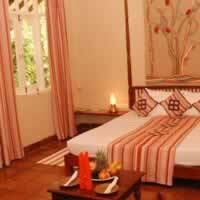 Bungalow rooms are basic, simply decorated and spacious - each with an en-suite bathroom, lounge, dining area, barbeque facility and veranda. Guests can also have meals prepared by bungalow cooks. 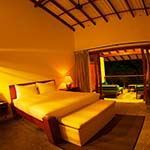 Aliya Resort offers comfortable accommodation is a beautiful setting midway between Habarana and Sigiriya. 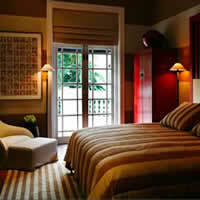 Guest rooms are spacious and en-suite, with all modern facilities including free WiFi. 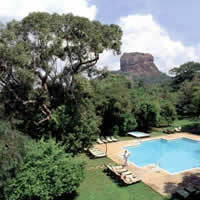 The hotel has four restaurants and a large outdoor swimming pool, with distant views of Sigiriya Rock. There is also a fitness centre and relaxing spa. 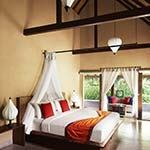 Amaya Lake is a 50-acre eco-friendly sanctuary located on the shores of Kandamala Lake in Dambulla. It offers luxury accommodation, with three dining options and an outdoor swimming pool. Each guest room has all modern amenities, including a TV, minibar and private bathroom. Suites have a private pool and spa bath. 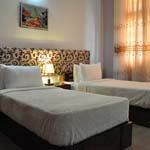 Cinnamon Lodge is situated in Habarana in the heart of the cultural triangle. All luxury en-suite rooms are very spacious with TV, mini bar and all modern amenities including free WiFi. 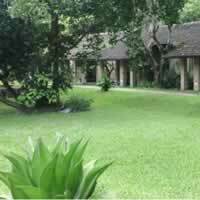 The lodge has extensive gardens set around a large lake, with wonderful bird watching opportunities. Monkeys also roam free. The hotel has two large swimming pools and a spa. 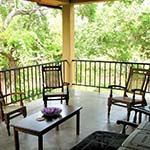 Lake Lodge is a small boutique hotel situated in the village of Kandalama, in the heart of the Cultural Triangle near Dambulla. Guest rooms are air conditioned and en-suite, each with minibar, satellite TV, free WiFi, hairdryer, safe and tea/coffee facilities. 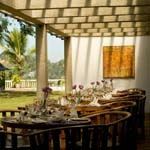 There is an open-air a la carte restaurant offering a wide range of wines, and a lovely lake view terrace. Other facilities include a gym, spa, bar and swimming pool. 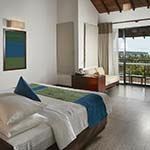 Sigiriana by Thilanka is a luxury resort & spa resort situated near Dambulla, in the heart of the Cultural Triangle. 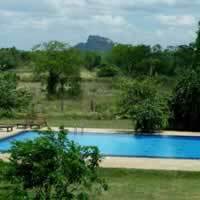 It is surrounded by 25-acres of mango orchard and rice fields, close to the Dambulla River. Guest rooms are en-suite and equipped with all modern amenities including satellite TV, safe, minibar, hairdryer and tea/coffee making facilities. Each room has a spacious balcony. The restaurant offers Sri Lankan fusion cuisine and there is also a bar. Other facilities include a pool and therapeutic Ayurvedic spa. 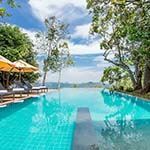 Heritance Kandalama is a serene luxury hotel situated in Dambulla, surrounded by mountains and overlooking Kandalama Lake. 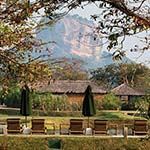 The timber panelled guest rooms are air-conditioned, with spectacular views of either Sigiriya Rock or the lush tropical jungle. Each en-suite room has tea/coffee making facilities, satellite TV, minibar, private balcony and Wi-Fi on request. 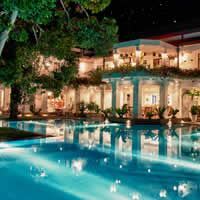 There are three swimming pools, including an infinity pool and the restaurant serves delicious local and European cuisine. You can also relax at the spa or enjoy the gym. 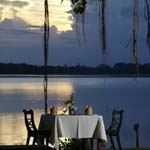 Jetwing Vil Uyana (meaning 'garden of lakes') offers luxury modern accommodation in a harmonious wetland setting near Sigiriya. 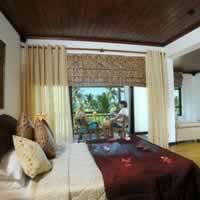 Each air conditioned guest room features teak flooring, free WiFi, cable TV and private balcony. All day dining is available at the Apsara Restaurant and light snacks are offered at the Sulang. You can also relax at the Graffiti Bar, enjoy a relaxing massage at the spa, use the fitness centre and enjoy the indoor swimming pool. 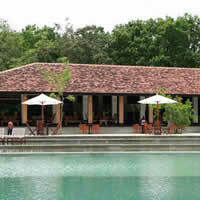 Water Garden is a luxury boutique hotel surrounded by lakes and water streams, with wonderful views of Sigiriya Rock. 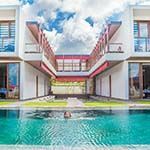 Each elegantly furnished and spacious contemporary villa has large windows and features a king-size bed, air-conditioning, deep bath tub, twin basins and a seating area. 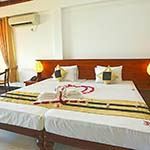 Satellite TV, ceiling fan, mini-bar, Wi-Fi, tea / coffee making facilities, safe, bathrobes and slippers are also provided. You can relax in the spa or by the swimming pool and dine on delicious international cuisine al fresco or in the main restaurant. 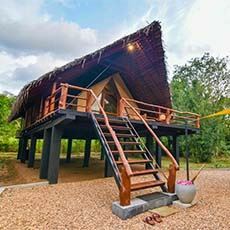 Wild Grass Nature Resort is a luxury eco-retreat situated amidst the forests of Sigiriya in the Cultural Triangle. It is surrounded by a beautiful lake and the Kandalama Hills. 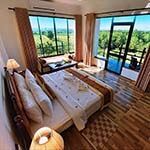 Each spacious air-conditioned villa is bright with large windows, king size bed,en-suite bathroom with open-air shower, living room and decked veranda or balcony. 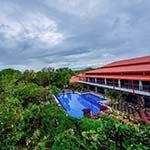 The hotel has an outdoor swimming pool and many nature and wellbeing activities. Both international and local cuisines are prepared on-site, with vegetarian, vegan and gluten-free options available on request. 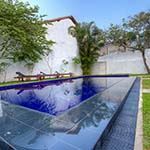 Tamarind Hill is a beautifully restored colonial style property, now a luxury heritage hotel, situated on the outskirts of the historic city of Galle. The en-suite guestrooms are spacious and feature beautiful period furniture mixed with contemporary paintings. 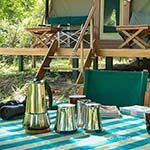 Each has a four poster king-size bed, air-conditioning, satellite TV, mini-bar, rainshower, free Wi-Fi and tea / coffee making facilities. Enjoy the covered, open-sided bar / lounge area, swimming pool and relax in the spa. 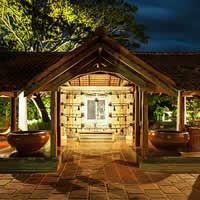 Dine inside the elegant restaurant or under the boughs of a Tamarind Tree on the courtyard terrace. 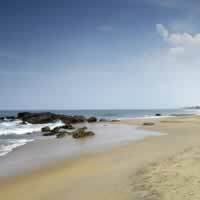 Thaproban Beach is a seafront resort situated on beautiful Unawatuna Beach, approximately 3-miles from historical Galle Fort. 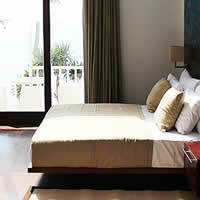 The en-suite air-conditioned guest rooms are comfortable and feature a balcony or patio, with full or partial sea views. 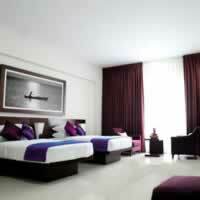 Satellite TV, free Wi-Fi, mini-bar and complimentary toiletries are provided. 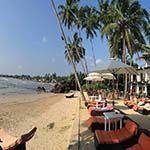 You can dine in the restaurant or on the beach, where you will be served traditional Sri Lankan or international cusine. 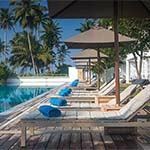 CoCo Bay is a luxury boutique hotel situated in the fishing village of Unawatuna, with views across the bay towards Galle Fort. 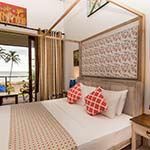 This beach resort offers air-conditioned en-suite rooms with a spa bath, rain shower, king sized beds, wooden floors and a seating area. Each room has a large balcony with private dining facilities and day beds. Satellite TV, free Wi-Fi, ceiling fans, complimentary toiletries, tea/coffee making facilities, bathrobes and slippers are provided. 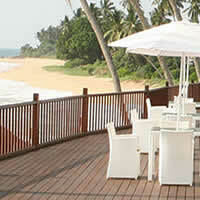 The beachfront restaurant serves a delicious variety of Sri Lankan, Chinese and International dishes. You can also enjoy the hotel gym or take yoga classes during your stay. 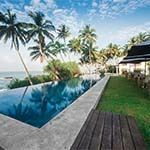 Era Beach is a beautiful Dutch colonial villa situated on a secluded beach in Thalpe in southern Sri Lanka, only 15-minutes by car from the historic fortified city of Galle. 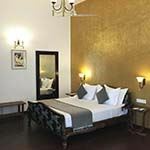 Accommodation is in spacious air-conditioned rooms and suites, each with antique furniture, private bathroom with rain shower and terrace. Some suites have beautiful sea views. Facilities include free WiFi, TV, hair dryer, bathrobe, slippers, safe and tea/coffee making facilities. 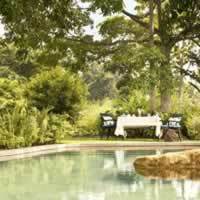 Delicious cuisine is served in the restaurant and there is a lush tropical garden with a swimming pool for relaxation. 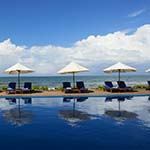 Shinagawa Beach is a luxury beachfront boutique hotel, located in a beautiful secluded bay in Balapitiya, with all rooms having sweeping views of the Indian Ocean. 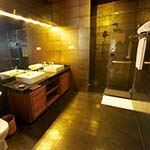 Each air conditioned room is elegantly decorated, with the private bathroom having a deep bath tub and rainfall shower. Each bedroom opens out onto a private balcony. Satellite TV, minibar, safe, bathrobes, toiletries, complimentary high speed WiFi and coffee/tea making facilities are provided. 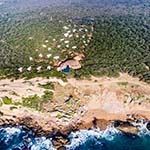 Other facilities include a private beach, swimming pool, fitness centre, spa, restaurant and bar. 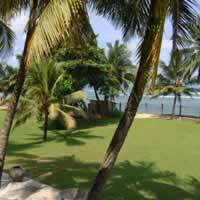 Lighthouse Hotel boasts beautiful views of the Indian Ocean from its hilltop setting outside Galle Fort. 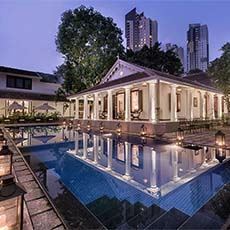 Minimalistic and elegant, this luxury colonial-style hotel features 4 dining options, 2 outdoor swimming pools and a spa. The spacious guest rooms each have a private balcony, dressing room, TV, DVD player and tea/coffee facilities. The en-suite bathroom has both bathtub and a shower. 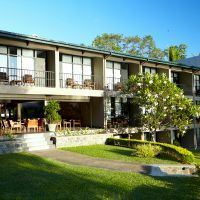 Kahanda Kanda is one of southern Sri Lanka's most stylish boutique hotels, offering air-conditioned and very individual suites with breathtaking panoramic views of palm fringed jungle and the KK tea estate. Each bedroom suite is in a stand-alone building, except for the Garden and Tea Suites, thus ensuring maximum privacy and peaceful surroundings for our guests. 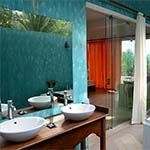 Each suite is decorated in a different style and has solar power heating for the hot water. Closenberg (meaning ‘citadel on which the sea roars’) was originally an island in Galle harbour, on which the Dutch built a small fortification with a battery of two guns. After this was abandoned, the British Captain Francis Bayley built a mansion over the ruins in 1860. 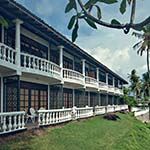 Today it is a heritage hotel set amidst lush tropical gardens on a peninsula overlooking historic Galle Fort and Magalle Bay. All en-suite guest rooms are air conditioned with minibar, safe, tea & coffee facility and private balconies with panoramic ocean views. Other facilities include an infinity swimming pool and terrace, with cocktail bar and sushi kitchen. 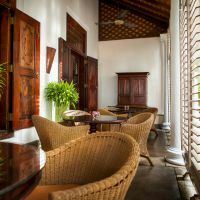 Deco On 44 is a charming boutique hotel located in a restored 1930’s art deco building inside Galle Fort. 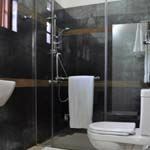 Stylish rooms are fitted with a flat-screen satellite TV, with mosaic designs and a rain shower. 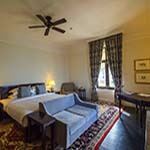 Each room offers a comfortable armchair and writing desk and the hotel has an outdoor swimming pool and library. 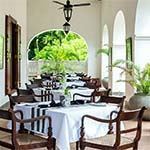 Fort Printers is an 18th century mansion and former printing company, now restored as an elegant, industrial / chic hotel, situated in Galle, in view of the lighthouse. The spacious en-suite guest rooms are individually themed, featuring comfortable beds, seating area, wooden or stone floors, exposed beams and antique bath tubs or copper lined rain showers. 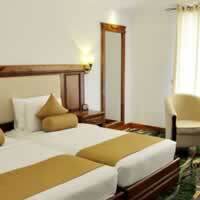 Air-conditioning, complimentary toiletries, mini-bar and high speed Wi-Fi are provided. 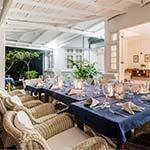 Dine in the restaurant or on the terrace by the courtyard pool, where fresh seafood and Sri Lankan or international dishes, made with organic local produce, are served. 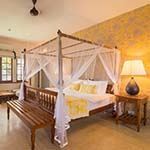 Fortaleza is a quiet refurbished Dutch colonial-style boutique hotel, situated in the heart of Galle Fort. The old building has been enhanced by a contemporary extension that runs along the cobbled courtyard. 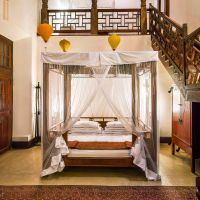 The rooms are spacious and elegant, featuring a four poster bed, Indian fabrics, dhurrie rugs, armchair and modern bathroom with walk-in rainshower. Free Wi-Fi, safe, toiletries and mosquito nets are provided. Guests can indulge in a massage at the in-house spa, relax in the bar and dine in the restaurant that serves international cuisine. 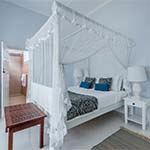 The Owl & The Pussycat is a tranquil luxury boutique hotel, with an eclectic and elegant bohemian decor, situated on the beachfront with excellent views of the ocean. The air-conditioned, en-suite rooms are individually decorated and have comfortable beds, colourful soft furnishings, textiles and artwork, opening out onto a balcony with excellent views of the coastline. Free Wi-Fi and coffee/tea making facilities are provided. 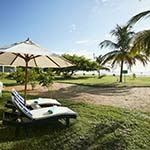 Relax on the terrace, enjoy the gym and swim in the outdoor pool surrounded by coconut trees. 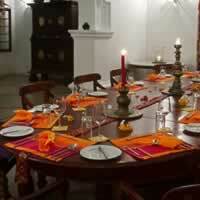 Fort Bazaar is a historic boutique hotel situated in the heart of Galle Fort. 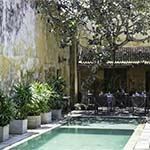 Once the home of a wealthy 16th century merchant, today it offers stylish modern accommodation, set around a central courtyard. All guest rooms are en-suite, with free WiFi and free soft drinks in the minibar. High tea is also served for all in-house guests. 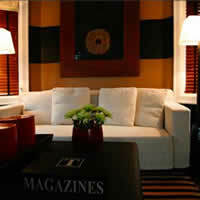 Other facilities include the acclaimed Church Street Social Restaurant and the luxury Z Spa. 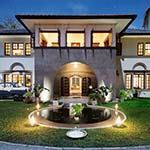 Le Grande Galle is a luxury modern luxury hotel situated on the coast outside the fortified city. 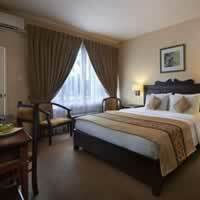 All spacious guest rooms are en-suite, with elegant décor and air-conditioning. 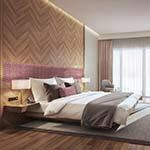 Each bedroom has wooden flooring and furnishings, private veranda and direct access to the outdoor swimming pool. 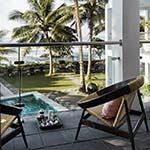 Enjoy the spa, gym, pool-side bar and dine al fresco on the main deck, with views of Galle Fort. 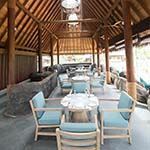 You can also dine in the open-plan dining pavilion, which serves fresh local seafood. 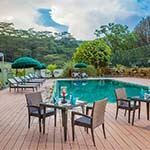 Amaara Sky is a small luxury boutique hotel situated high on a mountain overlooking the city centre of Kandy. 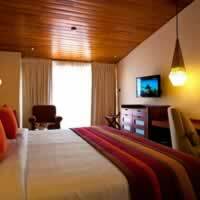 Each well-appointed en-suite guest room is equipped with TV, DVD player and all modern amenities. The food is delicious food, staff are friendly and service is good. 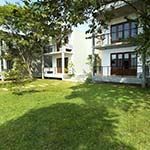 Serene Grand is nestled within a beautiful landscaped garden in Kandy, offering spectacular views. It provides spacious accommodation equipped with modern amenities, including free Wi-Fi in public areas. 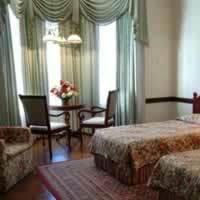 All rooms are air conditioned and have a minibar, satellite TV, writing desk and free toiletries. 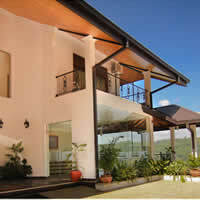 Amaya Hills is set in the picturesque hilltops high above Kandy town, with beautiful views over the Hanthana Mountains. 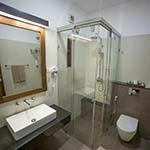 Built along the lines of a Kandyan Palace, each luxury guest room offers bathrobes, hair dryer, toiletries, electric shaver socket, safe, mini bar and tea/coffee facilities. There is free WiFi in the hotel lobby and a large swimming pool. Influenced by the old and inspired by the new, Cinnamon Citadel has combined retro chic design with the rich heritage of this ancient kingdom. 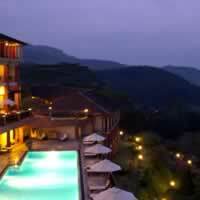 This hotel is one of the most stylish hotel in the hills of Sri Lanka. The room interiors take on a mix and match of heritage red, with mustards and crimson to highlight royalty and majesty for which Kandy is renowned. 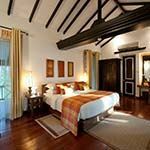 The rooms are located on three different wings giving guests the choice of either a garden or river view. There is free WiFi. 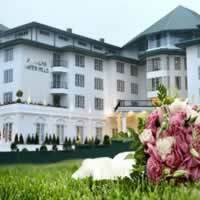 Earls Regent Hotel is set high amongst the misty hills above Kandy. 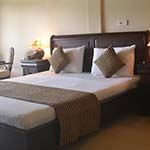 The airy and spacious guest rooms combine the essence of traditional Kandyan heritage with modern day luxuries. Facilities include satellite TV, air conditioning, free Wi-Fi, tea/coffee facilities, mini bar, hair dryer, toiletries, bathrobe & slippers. There is also a large outdoor swimming pool. 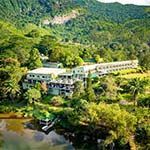 The exotic feel of Mahaweli Reach hotel extends to its tastefully decorated rooms, each with their own private balcony with views over the Mahaweli River and the tropical gardens of the hotel. 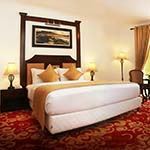 Each guest room has been individually styled with both colonial and traditional Kandyan designs and fitted with all modern amenities - including high speed WiFi, air conditioning, LCD screen television and safe. 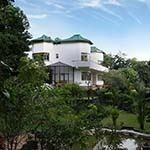 Mountbatten Bungalow is a boutique hotel situated in 6-acres of carefully tendered lawn and tea gardens about 15-minutes from the capital city of Kandy. This elegant Victorian residence dates back over 100 years and offers spacious accommodation in bungalow rooms, garden chalets and suites - all exuding a gentle nostalgia of days gone by, with hand embroidered pillows and muslin draped four-poster beds. 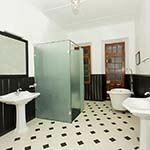 The polished original cement floors are buffed to perfection and the bathroom colour schemes are suggestive of the late Victorian era, but with ultra-modern fittings. Enjoy delicious meals in the dining room and relax at the Tea Spa. 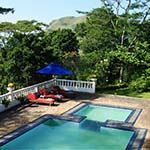 Mowbray House offers luxury accommodation in Hindagala, which is 3-miles from Peradeniya Botanical Gardens on the outskirts of Kandy. 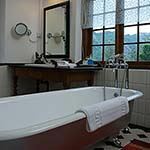 Each comfortable guest room has mountain or garden views and a private bathroom with either a bath or shower. 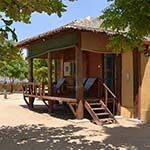 Free WiFi is offered and the property has a spice garden, where cookery is demonstrated. The Mowbray Tea Factory is a 5-minute walk away. 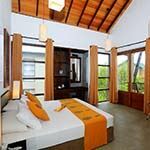 OZO Kandy offers modern accommodation near the Temple of the Tooth, with stunning views over the surrounding hills. En-suite guest rooms feature soft beds and plush pillow, TV, free WiFi, coffee and tea making facilities and a rain shower. The EAT Restaurant offers all day dining. You can also relax at the Lake Edge restaurant on in the Bommu rooftop bar and lounge. 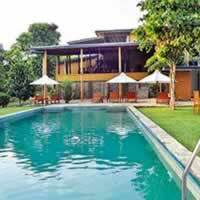 Thilanka is a modern hotel situated on the outskirts of the bustling city of Kandy, offering a tranquil retreat surrounded by nature. 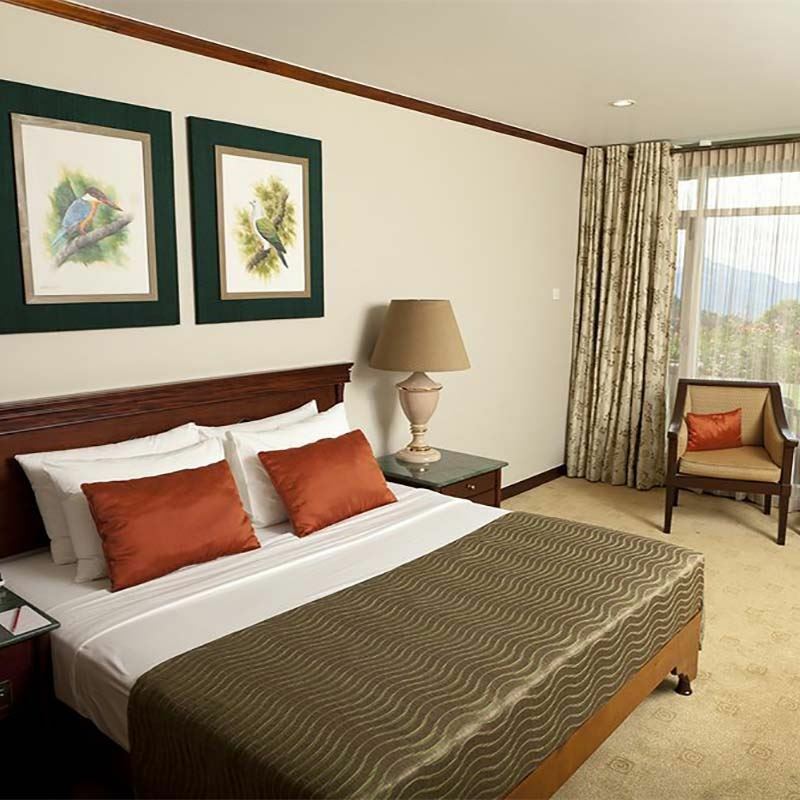 All guest rooms are en-suite and each has a private balcony with views of Kandy Lake or Udawattekelle Forest. 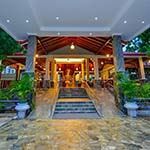 Hotel facilities include a swimming pool, spa and a restaurant. 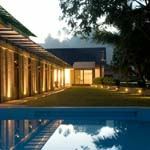 Clove Villa is a small luxury boutique hotel situated 10-minutes from the centre of Kandy, surrounded by manicured lawns and fruit trees. 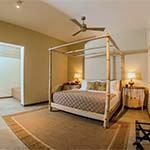 Each beautifully furnished guest room has a private bathroom, TV, air conditioning, tea & coffee facilities and ceiling fan. 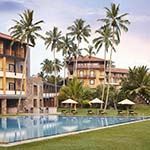 Other facilities include a swimming pool and indoor and outdoor dining, with a wide variety of Sri Lankan and international cuisine on offer. 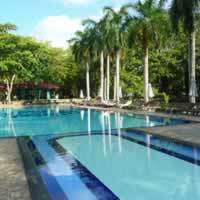 Earl's Regency is a luxury hotel offering spacious accommodation with a spa and outdoor swimming pool. Free Wi-Fi is available in the main lobby and in the Mountbatten Lounge and Spice Bar. Air-conditioned guestrooms offer views of the surrounding mountains and each room is equipped with a minibar, tea/coffee making facilities and TV with satellite channels. 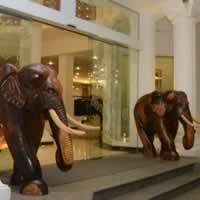 Elephant Stables is situated a short drive from the city centre of Kandy. 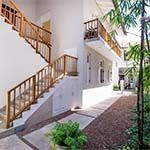 Originally a colonial bungalow, it is now a boutique heritage hotel offering spacious air-conditioned suites that are elegantly furnished with chic colonial-inspired décor. 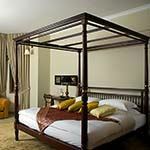 Each suite features four-poster or twin beds and en-suite bathroom. 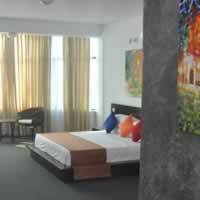 Free Wi-Fi, safe, mini-bar and satellite TV are provided. 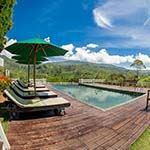 You can relax by the infinity pool looking out over the surrounding hills or in the lush garden. 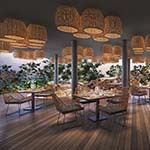 Enjoy the cocktail bar and dine in the restaurant that serves Sri Lankan, Thai and international cuisine. 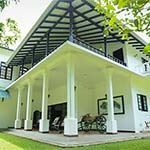 Surrounded by lush vegetation and vibrant paddy fields this colonial mansion is just four miles from the bustle of the ancient city of Kandy. 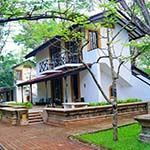 Kandy House is a wonderful example of understated Hill Country splendour. 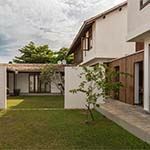 The architecture is solid and inviting with its wide arches, stone pillars, steep-pitched roofs and chairs with brightly upholstered cushions All rooms are named after butterflies which thrive in Sri Lanka, and are styled individually incorporating local fabrics, elegant furniture of various generations and all modern amenities. 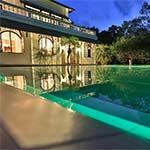 Pilas Villa is located in the foothills of the cloud-filled Knuckles Mountain Range in central Sri Lanka. 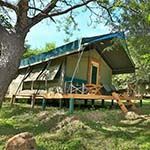 It offers simple but comfortable wooden cabins, each with their own private bathroom. Activities centre on walking and hiking in the mountains. 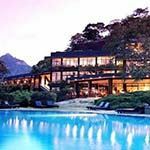 Amaya Hunas Falls is a luxury hotel situated in Elkaduwa, with wonderful views of Shaheen and the Knuckles Mountains with their dramatic waterfalls. 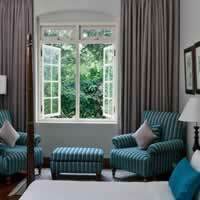 The bright elegant guest rooms are all en-suite, with seating area and large windows. 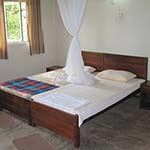 Satellite TV, safe, tea/coffee making facilities and minibar are provided. 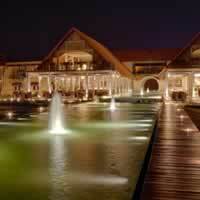 The hotel has a lounge, spa, outdoor swimming pool and private golf course. 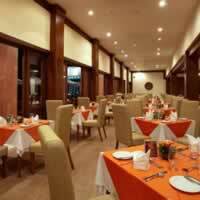 You can dine in the lakeside restaurant that serves Sri Lankan, Japanese, Italian, Middle Eastern and European cuisine. 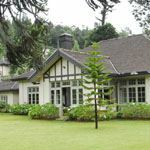 Ashburnham Estate is a luxury boutique hotel situated in a traditional 1930’s planters mansion, with views across its own 100-acre tea plantation towards the Knuckles Mountains. 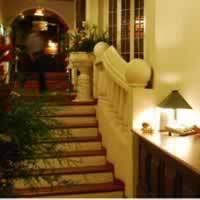 The hotel is situated in the heart of the Cultural Triangle, an hour northeast of Kandy. 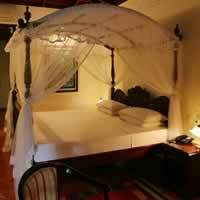 All guest rooms have elegant decor, large four poster bed, en-suite bathroom and most have a private patio. You can enjoy the swimming pool and relax in the lounge or at the ‘Aga Bar’ on the terrace. International and Sri Lankan cuisine is served in the dining room or al fresco. 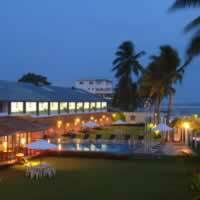 Amaloh is a luxury boutique hotel situated in the southern coastal town of Matara, close to Mirissa and a short walk to Polhena Beach. 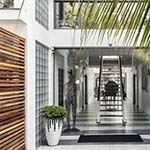 This elegant Dutch colonial style hotel features contemporary décor with dark wooden furniture, sofa, balcony or patio, and en-suite bathroom with rain shower. Some rooms have bathtubs. 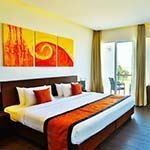 Air-conditioning, satellite TV, free Wi-Fi, coffee / tea maker, hairdryer, toiletries and safe are provided. A minibar is available on request. You can relax in the beachfront garden, outdoor sea-facing swimming pool, jacuzzi or bar and enjoy a traditional Ayurvedic massage in the spa. 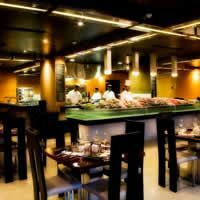 The restaurant serves fresh seafood and contemporary fusion Sri Lankan cuisine. 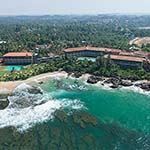 Mariott Weligama Bay is a luxury beachfront resort hotel situated in the heart of this small fishing village, with easy access to Galle Fort. All guest rooms and suites are sea facing, with every modern amenity and private bathroom. Hotel facilities include a fitness centre, full service spa, swimming pool and free Wi-Fi throughout the property. 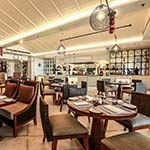 Dining options include Tides Restaurant for international cuisine, Weligama Kitchen for all day dining, Big Fish for seafood, Surf's Up for tapas and Mirissa Baking Company for quick bites. 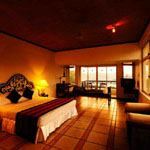 Ubuntu by Lantern is a luxury boutique hotel, situated by the stunning beachfront in Mirissa, in an area famous for whale watching. Courtyard guest rooms are spacious with high ceilings and open onto a courtyard garden. 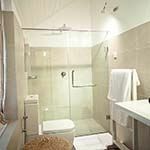 The large en-suite bathroom has indoor / outdoor high pressure rain showers and comfortable king size beds. Satellite TV, fan, air-conditioning, bathrobes, slippers and complimentary toilteries are provided. Relax on a sunlounger, by the swimming pool or have a treatment in the spa or your room. Dine in the restaurant next door at the Lantern Hotel. 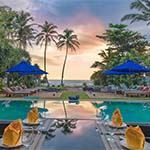 W15 is a luxury beachfront hotel overlooking Weligama Bay, with stunning views of the Indian Ocean. 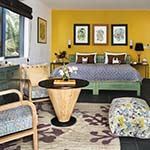 Surrounded by rubber and coconut plantations, each spacious contemporary guest room has air-conditioning, en-suite bathroom with shower, seating area and balcony with garden or sea views. Satellite TV, free Wi-Fi, safe, mini-bar, complimentary toiletries, bathrobes and coffee / tea making facilities are provided. 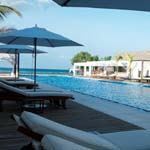 You can enjoy the outdoor swimming pool and beach, and dine in the restaurant that serves a fusion of Sri Lankan and international cuisine. 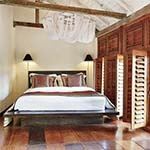 Elephant Stables is a delightful boutique hotel situated on crescent-shaped Weligama Bay, just a short walk from the beach. The luxury air-conditioned guest rooms have contemporary decor and feature four-poster wooden beds, premium bed linen, en-suite shower, seating area and balcony overlooking the garden and swimming pool, with stunning sea and sunset views. Free Wi-Fi, toiletries and hairdryer are provided. You can relax on the garden terrace or in the lounge, and dine on delicious Sri Lankan and international cuisine. 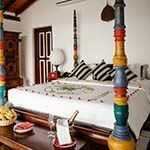 Lantern is a boutique hotel situated on a picturesque beach in Mirissa, overlooking the turquoise waters of the Indian Ocean. Each air-conditioned en-suite guest room has a lounge area, separated by wooden screens that open out onto a large balcony that overlooks the outdoor pool and garden. 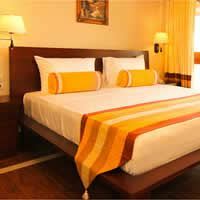 Luxurious bed linen, ceiling fan, WiFi, satellite TV, mini fridge, tea/coffee making facilities, toiletries, high pressure rain shower and day beds are provided. 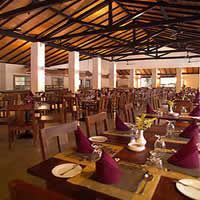 The restaurant serves traditional Sri Lankan and exotic fusion cuisine, using fresh organic ingredients grown on the estate. 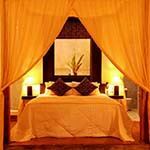 You can also enjoy a massage by a professional therapist in your room or at the spa. 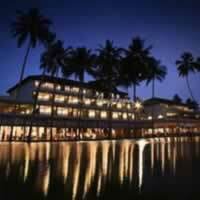 Sri Sharavi is a luxury hotel situated on the beach outside the small port of Mirissa. 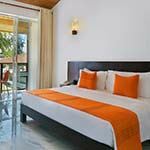 The bright and stylish beach villas are air-conditioned, each with a private bathroom, seating area and private balcony. 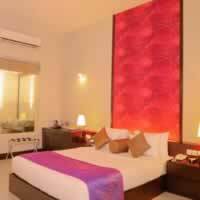 Satellite TV, free Wi-Fi, bathrobes, slippers, mini-bar, tea / coffee making facilities and safe are provided. 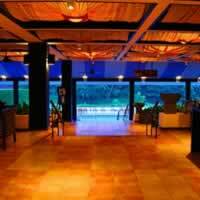 The resort offers an outdoor swimming pool, spa, cellar lounge and bar. 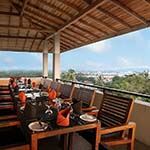 International and Sri Lankan cuisine are served on the pool deck, with stunning sea views. 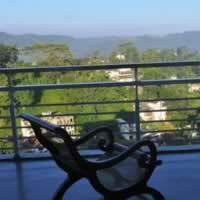 Araliya Green Hills is a beautiful hotel surrounded by lush greenery. 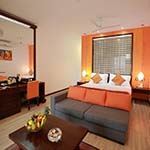 Guest rooms are tastefully furnished and each comes with a flat-screen TV, minibar, tea/coffee making facilities and dressing table. The en-suite bathroom has a bathtub and free toiletries. Free Wifi is available throughout the hotel and there is a relaxing spa. 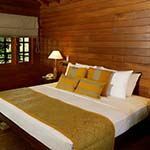 Located by the Nuwara Wewa Lake, Galway Forest Lodge Hotel is set amidst a natural landscape. 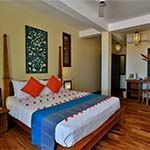 It offers an outdoor swimming pool, 2 dining options and rooms with a flat-screen cable TV. 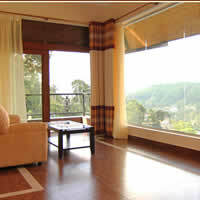 Cosy rooms feature large windows that provide natural light. 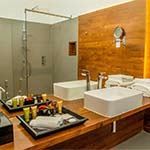 Included in all units are a minibar, tea/coffee maker and private bathroom with a shower. 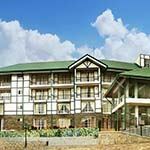 Boasting spectacular vistas and a tranquil setting this charming hotel offers a calm mountain haven overlooking nearby Nuwara Eliya. 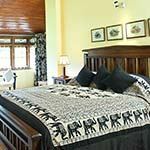 All ensuite rooms have wifi, laundry facilities and lovely views of the surrounding countryside and the city of Nuwara Eliya which can be enjoyed from each room's private balcony. 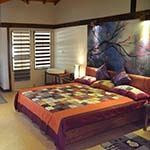 Anilana Craigbank is an exclusive private retreat situated in Nuwaya Eliya, and the perfect place for nature lovers. Relax and unwind in the beautiful gardens, enjoy evenings by the fireside and immerse yourself in the tranquil atmosphere. Each spacious en-suite guest room has views of the gardens and surrounding countryside. 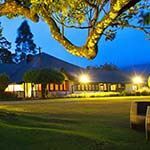 Ferncliff is a delightful boutique hotel set in expansive lawns in Nuwara Eliya. This colonial bungalow was built in the mid 1800s and has been a family home ever since. Each beautifully appointed guest room is spacious, with a private bathroom. The communal sitting room will keep you warm and content and the dining room offers traditional home cooking. Breakfast can also be enjoyed outdoors on the lawn, followed by a round of croquet. 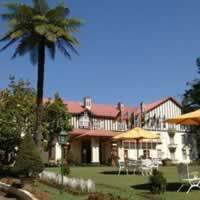 The Grand Hotel is situated on Nuwara Eliya hill, adjacent to the local golf course. 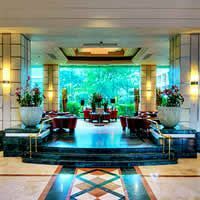 Surrounded by tropical greenery it features two restaurants, a shopping arcade and a gym. 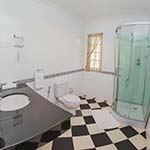 Each guest room has an en-suite bathroom, satellite TV, mini fridge and tea/coffee making facilities. 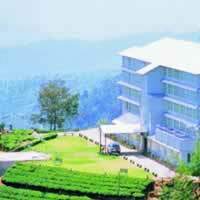 Heritance Tea Factory offers colonial-style rooms with views of the surrounding tea plantations and hills. 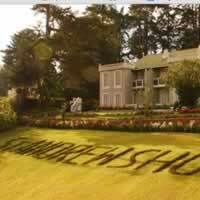 It features a luxurious spa, tea-picking tours and a restaurant set in a train carriage. Cosy guestrooms come with a minibar, cable TV and free organic tea leaves. 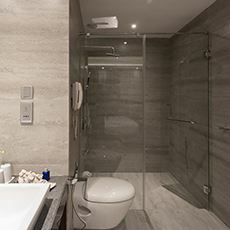 The en suite bathroom is fitted with a bathtub and a rain shower. 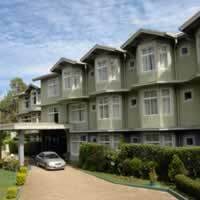 Jetwing St Andrew hotel is situated high in Sri Lanka’s hill country of Nuwara Eliya. This charming Tudor-style residence has fine wood furnishings, spacious air-conditioned rooms and cosy fireplaces for the winter. Each en-suite guest room has a bath robes, mini bar, safe and tea/coffee facilities. Free Wi-Fi is available and optional horse riding, guided birding and nature excursions are available on request. 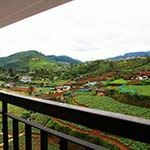 The Blackpool is situated in Nuwara Eliya, a short drive from Galway Forest Reserve with lovely views over the tea plantations. The elegant en-suite guest rooms have wooden furniture, comfortable beds and a private balcony overlooking the landscaped gardens. Satellite TV, free Wi-Fi and mini-bar are provided. There is a heated outdoor swimming pool, bar and lounge area. You can dine on the outdoor terrace or in the restaurant that serves both regional and international cuisine. 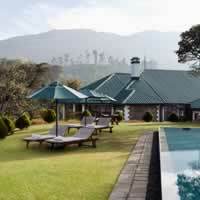 Langdale by Amaya is a delightful hideaway situated in the rolling hills of a tea plantation outside Nuwaya Eilya. 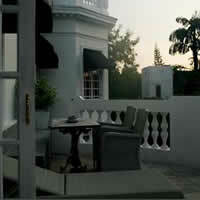 This luxury boutique hotel offers gracious colonial splendour in a beautiful setting. 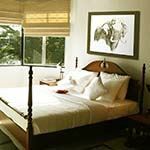 Guest rooms have down duvets, hand-woven cotton linen and antique wooden furniture. 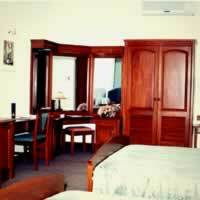 Amenities include satellite TV, free WiFi, hairdryer, minibar, tea/coffee maker, safe and thick bathrobes. Dining options include Chinese, Japanese, Italian, French, International and local cuisine. 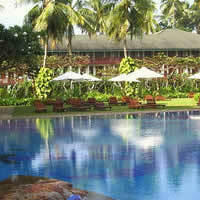 Hotel facilities include Ayurveda spa treatments, a heated swimming pool and grass tennis court. 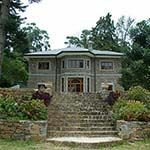 Warwick Gardens is an elegant colonial residence situated in Ambewela, a few miles south of the picturesque hill station of Nuwara Eliya. Reminiscent of a Scottish country mansion and surrounded by breathtaking views of mountains and valleys, the residence has been restored to its former glory and provides every modern comfort, whilst retaining its old world charm. 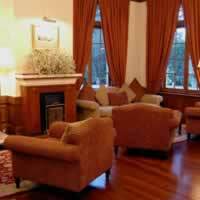 Guest room facilities include rain showers, tea/coffee facilities, electronic safe and wood burning fireplace. The restaurant serves a variety of delicious food, as well as al fresco lunches and outdoor barbeques. 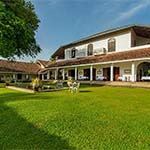 Horathapola Estate is a tranquil colonial style retreat situated among coconut plantations in rural Makandura, about 1.5-hours inland from Colombo. Coconuts, fruit, vegetables, herbs, spices and rice are grown on the estate, supporting around thirty families in the adjacent village. 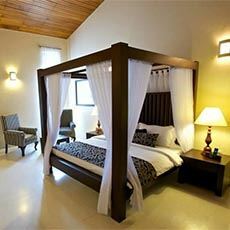 Each bungalow has a four poster bed, large en-suite bathroom, private balcony and patio or veranda. 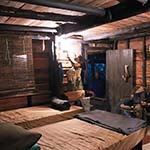 Air-conditioning, mosquito nets and free Wi-Fi are provided. 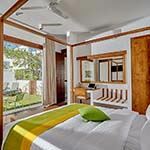 Each room has views of the garden which has a salt-water swimming pool, jacuzzi, walking trails and vibrant birdlife. Delicious Sri Lankan cuisine is served in the restaurant. 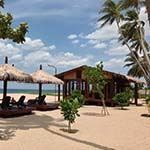 Calm Resort & Spa is a luxury beachfront resort situated a short walk from magnificent Pasikuda Beach. The elegant guest rooms have contemporary décor and each has comfortable beds, superbly fitted en-suite bathroom and balcony with views of the ocean. 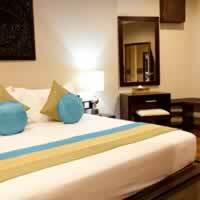 Satellite TV, free Wi-Fi, coffee/tea making facilities, bathrobes, slippers and air-conditioning are provided. 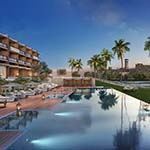 You can enjoy the poolside bar, spa, gym and private beach. The restaurant serves delicious international cuisine. 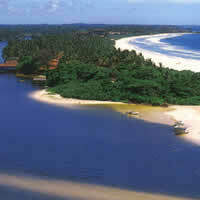 Coco Ville is a casual resort situated a short walk from the white sandy beaches of Pasikuda Bay. The colourful cabana chalets all have beach and ocean views. 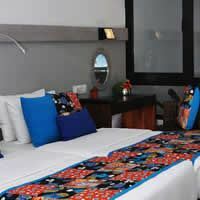 Each room has comfortable beds, private bathroom, seating area and sun deck. 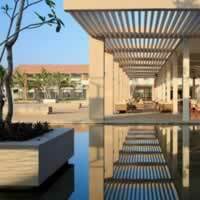 Other facilities include air-conditioning, satellite TV, tea/coffee facilities, minibar, free toiletries and Wi-Fi. You can dine on a fusion of home-style Sri Lankan and Asian dishes. 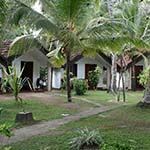 Passi Villas offers spacious accommodation close to the beautiful beach at Pasikudah on the east coast of Sri Lanka. 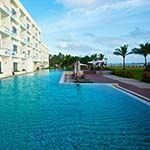 The hotel has a large outdoor swimming poll and a private beach area. Each guest room has a satellite TV, electric kettle and seating area. Some units have a terrace or balcony with sea views. 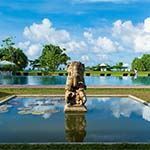 There is an on-site restaurant and many activities are available at the resort, including snorkelling, windsurfing, canoeing and diving. There is also free WiFi. 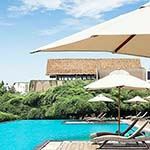 Amaya Beach is a luxury modern hotel situated on a magnificent Indian Ocean beach at Pasikuda, with an outdoor swimming pool close to the beach. All the spacious guest rooms and suites have private balconies, free WiFi, air-conditioning, satellite TV, safe and minibar. 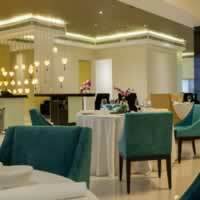 The hotel also has a restaurant, spa and fitness centre. 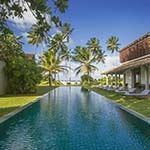 Anantaya Resort & Spa is situated on unspoilt Pasikudah Bay on the beautiful east coast of Sri Lanka, with its warm shallow waters and coral reefs. 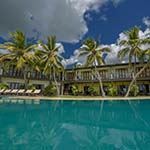 Luxury accommodation is offered in spacious guest rooms, pool suites and villas equipped with all modern facilities, each with private bathroom, minibar, free WiFi, dressing area and balcony or deck - many with views of the stunning Indian Ocean. Dining options include Sands beach bar, The Seaboard Deck for all day dining and The Blue Coral for seafood and fusion cuisine. There is also a luxury spa, many watersports and a gym. 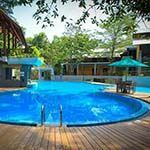 This carefully designed, luxury resort is a hidden gem, situated on a tranquil stretch of coastline near famous Pasikuda beach. 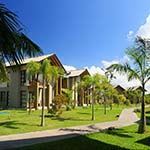 Facilities include a large outdoor swimming pool, a spa and a choice of dining options. The air conditioned uest rooms are spacious, with a modern style and all modern amenities including cable TV and free WiFi. 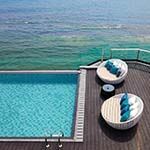 Private balconies afford views of the swimming pool and beyond to the Indian Ocean. 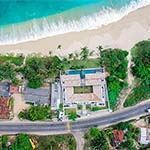 Uga Bay on the East Coast is among the best situated for the perfect beach holiday and offers tropical and Mediterranean architecture to create a stunning centrepiece in the beautiful bay. The semi-circular design ensures an ocean view from every one of the spacious rooms. Every room in this boutique hotel and resort come with air conditioning, complimentary Wi-Fi, and your own terrace. 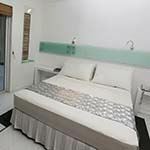 Each room also has a DVD player, Satellite TV, and a rain shower, along with all the amenities you would expect, from a tea or coffee maker and mini bar to an in-room safe, and hair dryer. 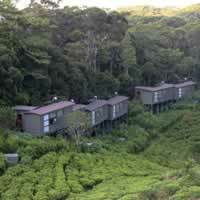 Rainforest Eco Lodge is a tranquil retreat set on a 500-acre tea plantation in Deniyaya, about 3,500 ft above sea level. This working tea estate borders the southern end of the Sinharaja Rainforest with small patches of rainforest within the tea estate. 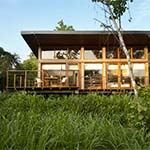 Individual chalets are situated amongst the tea bushes, each with a bedroom, en-suite bathroom with twin wash basins and shower, mini-fridge and tea/coffee facilities. 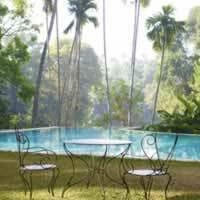 A small lounge area opens onto a private terrace, with views across the tea estate and the Sinharaja Reserve. 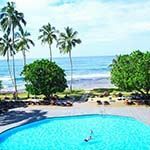 Citrus hotel, Hikkaduwa is located by the long, white, sandy beaches of southern Sri Lanka. 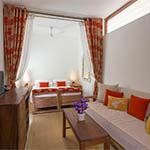 The en-suite, air-conditioned rooms are comfortable and elegantly decorated, with some opening out onto their own private balcony or terrace. Complimentary tea and coffee making facilities, mini bar, satelliteTV, WiFi, safety box, in-room dining and telephone are provided. 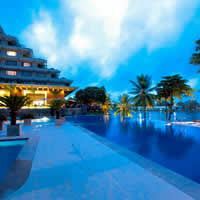 Enjoy the sea-facing outdoor pool, the bar and the open-air restaurant which serves both traditional Sri Lankan and European cuisine. You can visit local temples or try scuba diving and snorkelling to explore the magnificently colourful coral reefs. 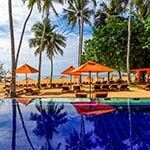 Citrus hotel, Waskaduwa is a tranquil luxury resort on the west coast, nestled by the magnificent unspoilt beaches, overlooking the Indian Ocean. 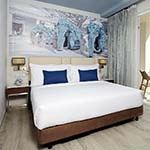 The en-suite, air-conditioned rooms are all decorated and furnished in a contemporary, elegant style, opening out onto their own sea-facing balcony. Large satellite TV, minbar, tea and coffee making facilities, safe, telephone and free WiFi are provided. 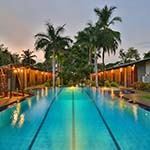 Enjoy the outdoor pool and the gym, relax in the spa, or dine in either of the 2 restaurants serving traditional Sri Lankan and European cuisine. The hotel also has 2 bars and coffee shop. 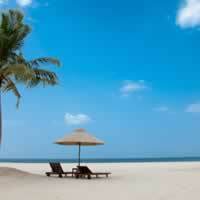 Coral Sands is wonderfully located right on Hikkaduwa Beach, opposite the Marine Park. 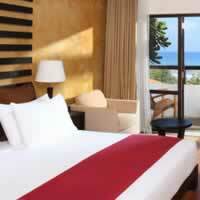 All air-conditioned en-suite guest rooms have a balcony and views of the Indian Ocean. Free toiletries and WiFi are provided and the hotel offers two swimming pools. 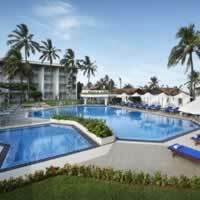 Tapro Spa Footprints is a tropical resort situated on the warm south coast at Beruwela. 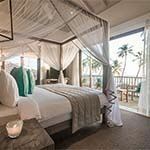 Its contemporary design blends stylishly with verdant flora, tall coconut trees, soft sandy beach and turquoise sea fringed by the Barberyn Reef. 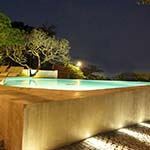 The ‘footprint’ swimming pool offers outdoor relaxation, as does the health spa. 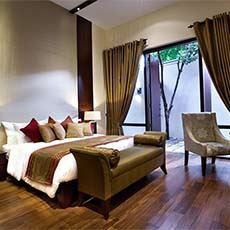 Featuring elegant dark wood furnishings, each air-conditioned room is spacious and has a private balcony. 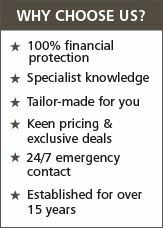 TV, minibar and safe are standard features in all rooms. 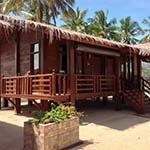 Taprobana Wadduwa is a tropical resort situated on the warm south coast at Wadduwa. Each modern air-conditioned guest room has a TV, desk, tea/coffee facilities, minibar, hairdryer and en-suite bathroom with shower and free toiletries. The hotel offers an outdoor swimming pool, spa and wellness centre. There is also free WiFi throughout the resort. 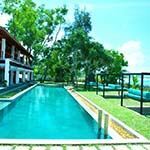 The Surf is a comfortable secluded hotel located in Bentota, overlooking the longest stretch of beach on the southwest coast. The low-rise architecture and contemporary decor has an exclusive feel. Each room is en-suite and has either a balcony or patio, TV with satellite channels, free WiFi, 24-hour room service, minibar, in-room safe and coffee making facilities. You can relax by one of the two sea-facing swimming pools. You can enjoy the gym, have a massage and hot tub in the spa and dine in the à la carte restaurant or poolside bar. 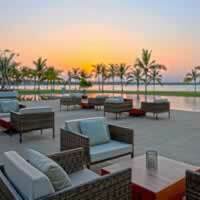 AVANI Bentota Resort & Spa is situated along one of Sri Lanka’s best beaches on the lush southwest coast. With beautiful lawns and unbeatable ocean views, the hotel blends contemporary style with an 18th century Dutch village feel. Decorated in a fresh contemporary style, all rooms and suites come with a private balcony or terrace with a view of the ocean and the stunning palm fringed beach. 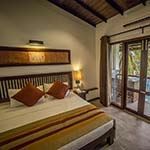 Modern comforts include air conditioning, safe, tea and coffee making facilities, mini bar, DVD player, free WiFi, and private bathroom with rain shower and free Spa Ceylon toiletries. 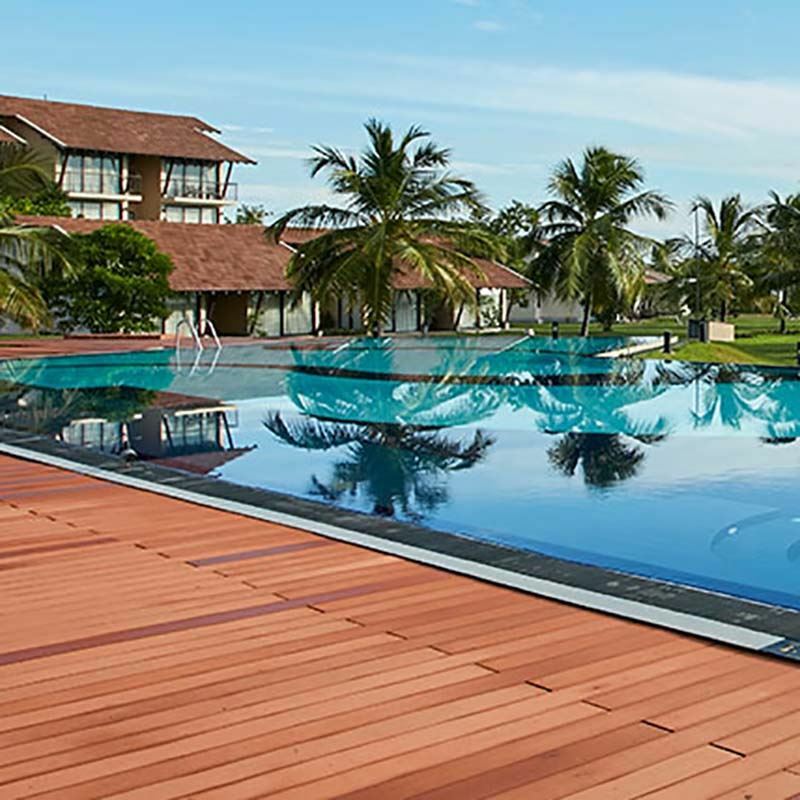 Bentota Beach Hotel is splendidly situated at the point where the Bentara River flows into the Indian Ocean, so it offers access to its famous broad golden beaches as well as water sports on the river. 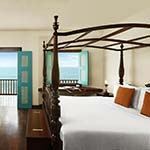 Rooms have sea-front or river-front views and are colour washed in beiges and whites. Each luxury en-suite bedroom is decorated with bright coloured bedspreads, bed runners and pillows and includes all modern amenities. 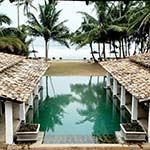 Calamansi Cove Villas is a secluded luxury resort, situated in Ahungalla amongst palm trees, in a tranquil cove by beautiful Balapitaya Beach. 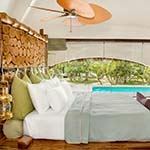 The spacious air-conditioned villas open out onto lush gardens or the beach with views of the ocean. 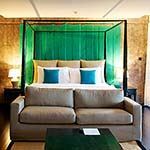 Each have a contemporary decor and feature a four poster bed, open lounge area, private landscaped garden, rooftop terrace and indoor and outdoor showers. 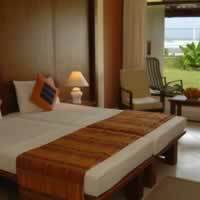 Satellite TV, free Wi-Fi, mini-bar, electronic safe, bath robes, sarong, slippers and beach bag are provided. 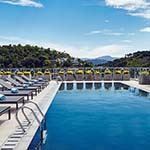 Take a dip in the large outdoor swimming pool and relax on the sun beds. 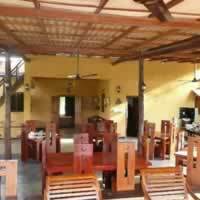 There is a choice of two restaurants and a bar, serving international and local dishes. 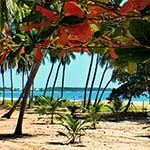 Cinnamon Bey is beautifully situated on Beruwela beach, where you can walk for miles along its palm fringed golden beaches. 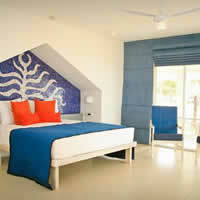 The spacious and luxurious rooms are decorated with lattice work in complementary hues. 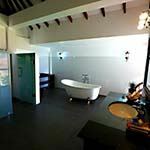 Deluxe rooms have a terrace and jacuzzi and are located in a separate wing with a secluded swimming pool, restaurant and bar. The hotel has 9 dining options, gym and spa. 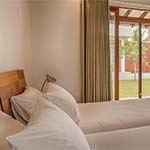 Located along Sri Lanka’s beautiful southern coast, Chaaya Tranz Hikkaduwa offers spacious rooms with private balconies and 32-inch flat-screen TVs. 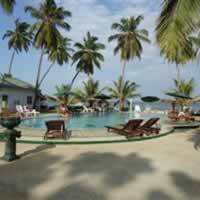 It features an outdoor pool and PADI dive centre. 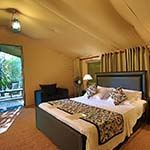 Rooms feature comfortable outdoor seating in the private balcony, air-conditioning and are fitted with colourful fabrics and DVD players. A hairdryer, safe and free toiletries are also provided. 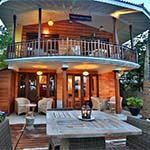 Michelle is a small boutique hotel situated in Balapitiya on the warm south coast. Each luxury suite is designed to enjoy the spectacular sea views and offers TV, DVD Player, iPod dock, tea/coffee facility, mini-fridge, room safe, hair dryer, iron and ironing board. 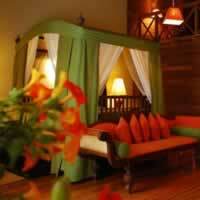 The hotel offers the ultimate in privacy and tailor made services, as well as the “Ariyana” Spa. 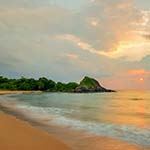 Kumu Beach is a chic luxury boutique hotel situated above a dramatic boulder lined beach at Balapitiya on the southwest coast. 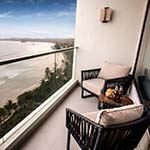 All guest rooms have an ocean view and some have a balcony or garden terrace. 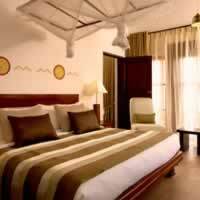 Each air-conditioned room is en-suite and Wi-Fi, minibar, satellite TV and coffee machine are provided. You can dine in the restaurant or on the main deck, with a stunning sunset view. You can also relax by the outdoor infinity swimming pool, at the spa or in the garden. Galle Fort is 1-hour away. 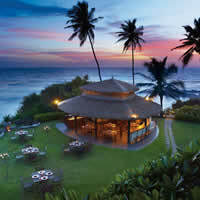 Vivanta is a luxury Taj hotel situated on the beach at Bentota, offering beautiful views of the Indian Ocean. 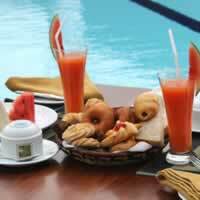 Pampering spa services, an outdoor swimming pool and five dining options are provided. Each luxury guest room come equipped with a minibar, tea/coffee facilities, cable TV and safety deposit box. 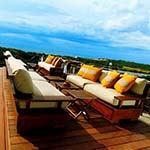 Private balconies have outdoor seating areas and overlook the sea. 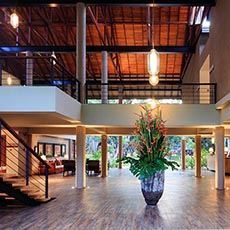 Located in the beautiful sea side resort town of Trincomalee in the North East coast of Sri Lanka, the Sea Lotus Park Hotel is an ideal base to explore the wonders of the area. 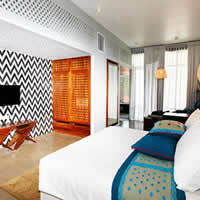 The rooms consist of 21 deluxe rooms, 17 standard rooms, 10 beach chalets and 6 suites. Standard room facilities include cable/satellite connection, private / en-suite bathroom, hairdryer, internet access, mini bar, 32" LCD television, telephone and DVD player. 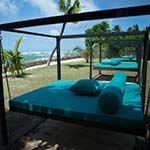 Nilaveli Beach Resort is a very small hotel situated on the closest beach to Pigeon Island, which offers the best snorkelling in Sri Lanka. 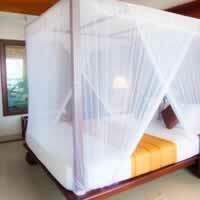 The air-conditioned wooden cabanas have luxury bedding and are decorated with handcrafted furniture. 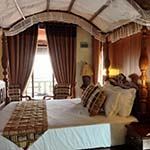 Each room has its own private balcony, en-suite bathroom, overhead fan, TV, DVD player, minibar and safe. 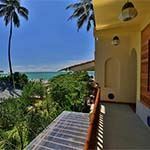 You can relax on loungers on your private waterfront deck, enjoy the beach, swim in the sea and dine at the restaurant, which serves both traditional Sri Lankan and European cuisine. 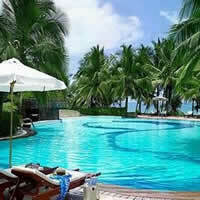 The hotel does not have a swimming pool, but you can swim in the sea which offers some shallow waters. 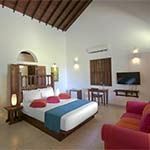 Trinco Blu is a relaxed beachfront resort situated on a spectacular beach at Trincomalee. The spacious guest rooms are simply furnished with a modern touch. 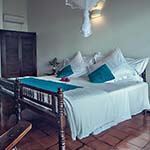 Each room has air-conditioning, TV, free WiFi, tea/coffee making facilities and minibar. 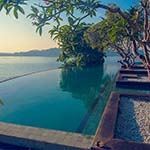 The resort has a large swimming pool, three restaurants and a PADI dive centre with water sports that include snorkelling, fishing and scuba diving. 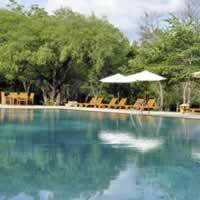 Jungle Beach is a luxury beach resort situated outside Trincomalee, with its own private beach. The stylish guest rooms feature modern interiors, warm lighting and large windows. 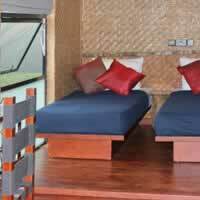 Each bedroom has a seating area, cable TV and en-suite bathroom with shower. Bathrobes and hairdryer are provided, as well as free WiFi. 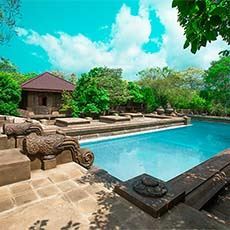 The lodge has a lovely swimming pool and other activities include cycling & fishing or indulge in a relaxing body massage. 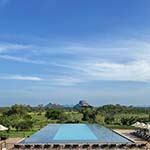 Centauria Wild is a luxury modern hotel situated near Udawalawe National Park. The en-suite guest rooms are light and spacious, with each having elegant décor, a seating area and private balcony with stunning views. 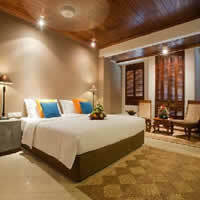 Satellite TV, air-conditioning, free Wi-fi, minibar, safe, complimentary toiletries, bathrobes and slippers are provided. 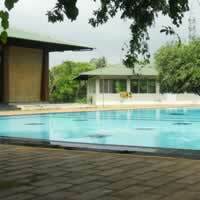 There is also an outdoor swimming pool, spa offering Ayurvedic treatments, steam room and gym. 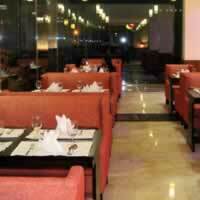 Enjoy the lounge bar and dine in the restaurant that serves international cuisine. 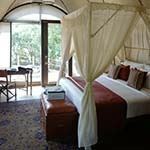 Grand Udawalawe offers comfortable accommodation in a jungle setting, close to the entrance to Udawalawe National Park. 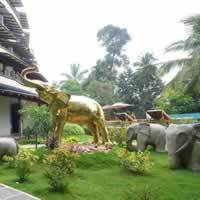 It is adjacent to the Ath Athuru Sevana Elephant Orphanage, which cares for abandoned baby elephants and returns them to the wild. 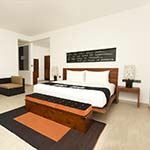 Each guest room has air-conditioning, TV, minibar, Wifi and private bathroom. There is also a swimming pool. 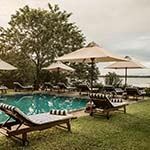 Kalu’s Hideaway is nestled in 5-acres of beautifully gardens and a 10-minute drive to the entrance to the Udawalawe National Park. This small hotel offers spacious en-suite guest rooms with all necessary amenities, including a large covered veranda and an outdoor swimming pool. 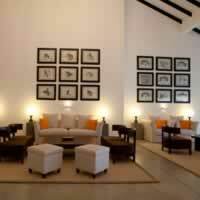 There is also free WiFi..
Thamara Vila is a luxury tented lodge situated in 7-acres of jungle, near the entrance into Wilpattu National Park. Surrounded by forest and lakes, birdlife is abundant here. 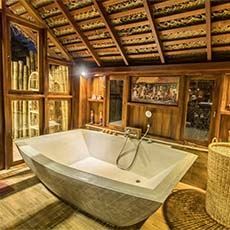 Each tented chalet is set on stilts and has a thatched roof, en-suite bathroom with large freestanding bathtub, open air shower, seating area and private veranda. 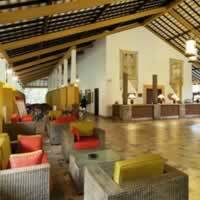 The main lounge and dining area has stylish furniture, high thatched ceilings and a large viewing deck. 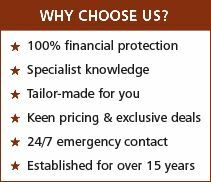 You can enjoy a barbeque around the campfire or dine indoors on delicious Sri Lankan and international cuisine. 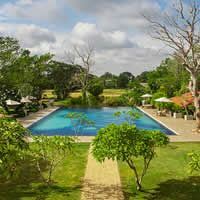 Elephant Reach is situated on 4-acres of beautiful countryside, within easy reach of Yala National Park. 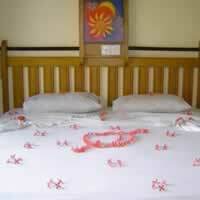 Each chalet is air-conditioned and most have interconnecting rooms suitable for families. Facilities include a mini bar, TV, hairdryer, tea/coffee station and spacious en-suite bathroom. There is a large outdoor swimming pool. 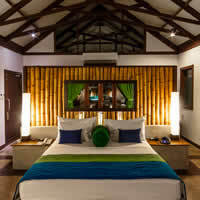 The Kent Hotel offers luxurious rooms, bungalows and cabanas which are inspired by tropical Asian architecture. 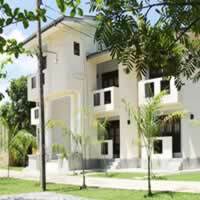 Facilities include air conditioning, TV with satellite channels, ceiling fans and private balconies. The hotel has a large outdoor swimming pool. 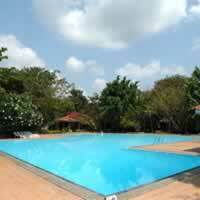 Kithala Resort is situated in the small town of Tissamaharama, between Kataragama and Yala National Park. Bundala National Park is also within easy reach. The spacious en-suite guest rooms are elegantly decorated and come equipped with all modern comforts including air conditioning, TV, minibar, safe, tea/coffee facillities and free WiFi. 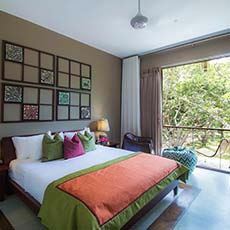 Each room has a private balcony with views over the paddy fields, with their abundant bird life. 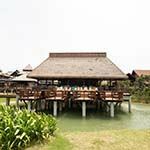 There is also a restaurant, bar and large outdoor swimming pool. 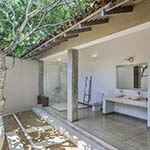 Cinnamon Wild is situated in coastal forest and sand dunes along the southern coast and 5-minutes from the entrance to Yala National Park. 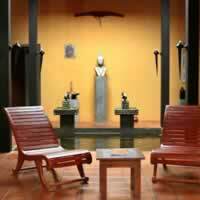 The hotel is decorated with large trunk boxes, old vintage furniture, directors' chairs and indigenous artwork. 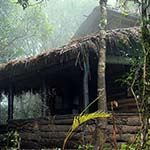 All jungle chalets are air-conditioned and are equipped with a TV, WiFi, mini bar, safety deposit box, tea/coffee making facility, hair dryer and complimentary toiletries. There are a few beach chalets with views over the ocean, although currents are too strong to swim here. 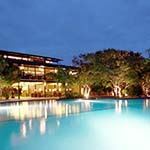 Jetwing Yala offers some of the best accommodation near Yala National Park, as well as a magnificent beach location. The spacious guest rooms each have a sitting area. Facilities include air conditioning, satellite TV, free Wi-Fi, hairdryer, bathrobes, slippers, minibar and tea/coffee facilities. 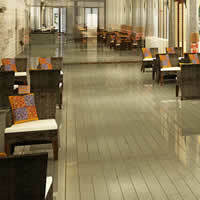 The hotel has a lounge area, bar and several dining options. 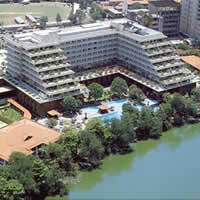 There is also an excellent spa and a large outdoor swimming pool. The beach is manned by lifeguards. 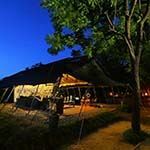 Kulu Tented Camp is situated in Yala National Park, surrounded by its flora and wildlife. 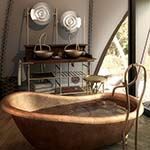 The luxury tents are set on raised wooden platforms, each with an en-suite bathroom with hand basin and hot shower. 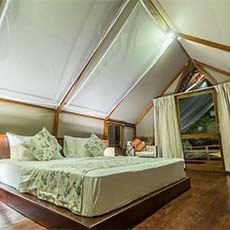 Each tent has comfortable beds, ceiling fan and a small private deck. 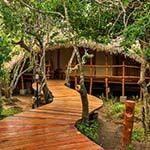 After a day of game viewing, you can relax in the tree house with its wonderful views. Afterwards enjoy a delicious dinner prepared from fresh produce, dining on your terrace or outside by the lake. 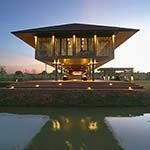 Thaulle Resort is beautifully located on Yoda Lake in southern Sri Lanka, within easy reach of Yala National Park. 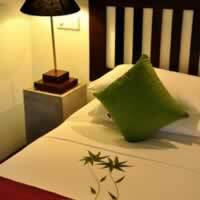 The hotel specialises in holistic Ayurvedic treatments and offers individually furnished en-suite rooms with antique furniture. 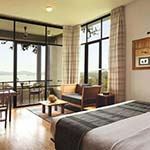 Each room has a large glass frontage with a balcony and views over the lake. The restaurant serves delicious local and international cuisine, with vegetables from the gardens and seafood from the lake. Free Wi-Fi is available and there is a large swimming pool and gym. 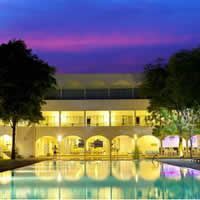 The Safari Hotel is a waterfront retreat situated on the shores of Lake Tissa, near Yala National Park. Each spacious, modern suite has satellite TV, air conditioning and free Wi-Fi. You can take in the beautiful colours of the sunset from the lake-facing restaurant which offers a variety of international dishes, or from the privacy of your own balcony. There is also a large outdoor swimming pool. 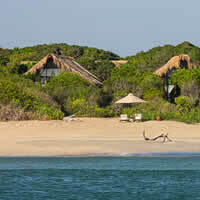 Wild Coast Tented Lodge is a luxury resort situated on the south coast, close to Yala National Park. The cocoon-shaped air-conditioned guest suites are covered in fabric, reflecting the shape of the boulders found in the surrounding landscape. 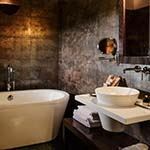 Each suite has a four poster king-size bed, teak flooring, dark leather seating, viewing deck and spacious en-suite bathroom furnished with a glass chandelier, handmade copper bathtub and twin basins. 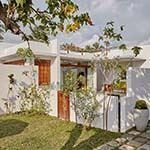 Wi-Fi, sound system and minibar are provided and there is also a spa, outdoor pool, bar and bamboo-clad dining pavillion that serves delicious Sri Lankan cuisine. 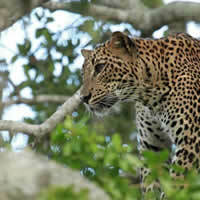 Leopard Trails is a luxury camp situated outside Yala National Park, offering an authentic tented safari experience. 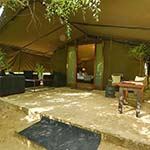 Each spacious air-conditioned tent is en suite and has comfortable beds, luggage rack, coir carpet and veranda with camping chairs. A small safe is provided. There is a large lounge and dining tent with bar, where Sri Lankan and international cuisine is served. You can also dine around the campfire under the stars. 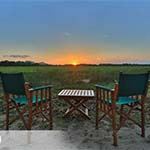 Uga Chena Huts is a luxury resort within an unspoilt wilderness, situated between tropical jungle and a saline lake, where painted storks and flamingos can be seen. 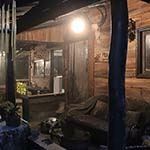 The guest cabins have rustic safari-themed decor with log wood crafted furniture. 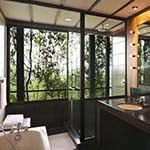 Each is climate controlled, en-suite with free standing bathtubs and twin basins, and feature a living area, bedroom, shaded outdoor deck and plunge pool. 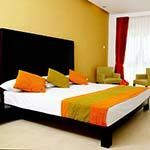 Large satellite TV, free Wi-Fi, mini-bar and tea / coffee making facilities are provided. Relax in the wellness spa, enjoy the swimming pool with adjacent bar and dine in the restaurant or by the beach.